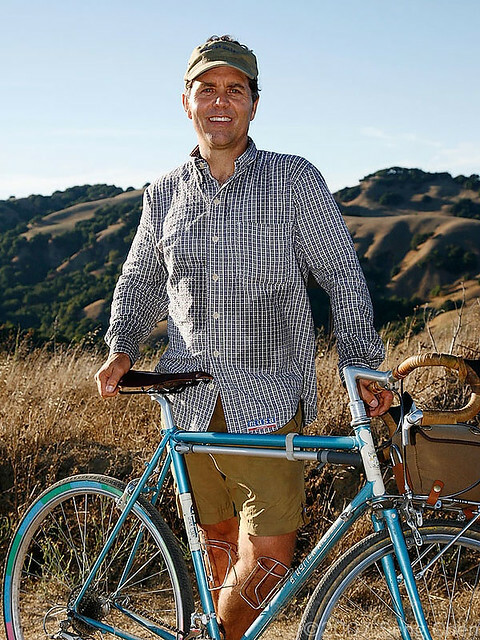 One of the big influences in the modern bike renaissance of steel frames, leather saddles, 650b wheels, fatter road tires, and all around comfortable fun biking is coming to Seattle on Friday, May 11th to talk about his new book “Just Ride – A Radically Practical Guide to Riding Your Bike”. I have one of his bikes and can attest to the well thought out design, beauty, comfort, and detailed execution of a Rivendell bicycle. He designed and marketed bikes for Bridgestone in the US from 1984-1994, introducing much loved iconic bicycles such as the RB-1, MB-0, and the thoroughly offbeat and cult status XO-1. His writing and design of the Bridgestone catalogs and Rivendell Readers has drawn a good-sized following of serious bikers who didn’t (and don’t) follow the mainstream race fork of bicycle marketing and industry. Jan Heine of Bicycle Quarterly did a great write up on him a few months ago on his blog: http://janheine.wordpress.com/2011/12/28/people-who-have-inspired-us-grant-petersen/. I’ve met Grant a couple times at his humble company headquarters in Walnut Creek, and he is the kind of personality who exemplifies the caring, leader of a modern American small business that treats its employees and customers well, and seems to make it through rough economic times (as well as good times) without trying to sell and appease towards only short term profits. Dude’s got it going on! He finds and markets products that are higher quality, longer-lasting, and may not be available if it were not for Rivendell’s market pull. The variety of things you can find on the Rivendell site boggles and really shows the unique mind that is Grant. What: He will do a book presentation from 5-5:30pm, a question and answer session from 5:30-6pm and a bike ride from 6-7pm. They will have books to sell.